Fairfield deputy bailiffs console Edward "Teddy" Shuman before escorting him to a jail cell after his arraignment Wednesday in Fairfield Municipal Court. He has been repeatedly institutionalized since age 7. 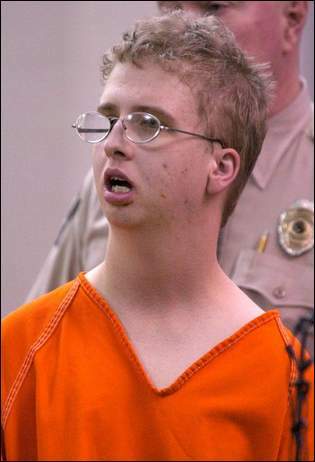 Edward "Teddy" Shuman has suffered from mental retardation and mental illness since he was a baby. He has been in and out of institutions and group homes since October 1992. Among his journeys: Beginning in 2002, he moved back to Cincinnati where he lived at his parents' home, a supervised apartment, and in various group homes. Spring to fall 2004: Went back and forth between a College Hill center and two group homes. At one of those homes, police were called because he assaulted a resident. 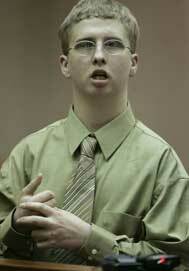 Feb. 16, 2005, he moved into the Southwest Ohio Developmental Center in Batavia per court order. In April, he was accused of assaulting a staff member, causing serious cuts. By November, Teddy had improved enough that officials told the family that a group home would be a better setting. Instead, on Feb. 16, 2006, he moved into the Fairfield Center, a more intensive center than a group home. Six days later he is accused of strangling his roommate, Joseph Beaudoin, 50. Edward "Teddy" Shuman listens to the court proceedings. 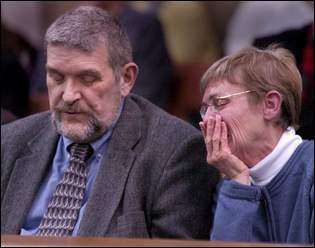 Thom and Bonnie Shuman react as their adopted son appears in court. Handcuffed, he tried to reach out to hug his parents. 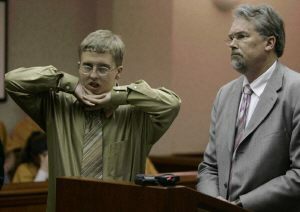 FAIRFIELD - While a judge tried to decide Wednesday what to do with the 20-year-old retarded man charged in the strangling of his roommate, the suspect said he just wanted to go home with his "mommy and daddy." Edward "Teddy" Shuman, shackled and handcuffed, laid his head on a bailiff's shoulder while officials tried to explain that he had to go back to jail. 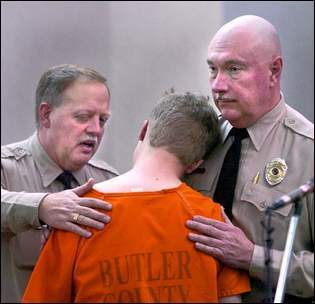 The bailiff patted Shuman on his back in an attempt to console him as Shuman sobbed. Shuman, a resident at Fairfield Center, was charged with murder Tuesday night in the death of 50-year-old Joseph Beaudoin. The privately owned center is home to 119 mentally challenged people. Shuman and Beaudoin shared Room 304, police said. Shuman was at Fairfield Center for a week after being moved from the Southwest Ohio Development Center in Batavia. The nursing staff at Fairfield found Beaudoin lying on the floor of the room with a belt around his neck about 6:15 p.m. Tuesday. He was pronounced dead at Mercy Hospital Fairfield. According to a police report, Shuman - whose parents say he has many mental problems and a history of violent behavior - told officers that he held the belt tightly around Beaudoin's neck, and that Beaudoin turned blue and stopped breathing. Wednesday, Fairfield Municipal Judge Joyce Campbell ordered a competency evaluation for Shuman after it became clear that Shuman didn't understand what was happening. "I done nothing wrong," he told the judge. "I want to go home now." He tried to reach out to his parents, who were sitting in the front of the courtroom. They never got to hug. Bonnie and Thom Shuman - he a pastor; she a school aide in special education - said their son has been in and out of psychiatric wards, residential institutions and group homes since age 7, when he became uncontrollably violent. The Greenhills couple adopted their son at 18 months. He was from Oklahoma. Sexually and physically abused as an infant, he didn't speak until he was 6. He was later diagnosed with mental retardation, profound developmental disabilities, fetal alcohol syndrome and explosive behavior disorder. The explosive behavior disorder is the reason he has been repeatedly institutionalized, his parents said. The Shumans say the call about the attack took them by surprise. "I thought it was a dream and it was a nightmare," Thom Shuman said. Butler County Prosecutor Robin Piper said it's too soon to say how the legal system will handle Shuman's case, given his disabilities. He intends to proceed with prosecution, which is likely to focus on Shuman's competency and sanity before it ever gets to trial. "You have to be careful not to rush to judgment. ... Sometimes the facts determine that they may have that condition, but it's not exactly a rational explanation for their culpability," Piper said. Thom Shuman hopes his son will end up institutionalized instead of in prison, where he could be a target for abuse because of his mental capacity. "My best hope is that Teddy is able to be placed in a setting where he can be safe and secure and as successful as Teddy can be," he said. "It's fair for the system to let the legal process run its course. But, it's not fair to treat him like every other case. ... He's just a very broken individual. It's time to help make him whole." The Shumans say their son's movements from place to place over the years and his recent switch to Fairfield Center may have triggered Tuesday's attack. They say they have been frustrated for years by the difficulty of finding local services for young people with severe mental illness. In 2000, an Enquirer investigation revealed that many area families have had no choice but to send their children out of town for care. Those problems still exist, the Shumans say. Over and over, the Shumans tried to keep their son in more restrictive settings, where they say he was better off. But Teddy Shuman was released every time he showed enough signs of improvement. "It's an amazing world," Thom Shuman said. "The police knew about Teddy. The people in the hospital knew about Teddy. But what is the government doing? They're shutting down as many of these facilities as they can." Teddy Shuman assaulted a resident at a group home in 2004, then a staff member at the Batavia center just a year ago. But more recently, the couple thought he was getting better. There had been fewer incidents, and those that occurred were less violent. "We had finally stopped worrying about it. I think we finally stopped walking on eggshells," Bonnie Shuman said. No one can explain a motive for Beaudoin's death, if there was one. Beaudoin's family could not be reached for comment. The Shumans said their son was happy at Fairfield Center. In fact, he was well enough to join his parents on an outing to church Sunday and a party for a local golden retriever rescue organization. As recently as Tuesday, the family went out together for dinner at Cincinnati Mills mall. He didn't talk of any problems with his roommate, even as recently as a few hours before the slaying when he spoke with his father by phone. Fairfield Center officials would not talk about the incident. In a faxed statement, Administrator Cheryl Farnsley said the staff was saddened by the death of one of their residents, and that their facility met federal requirements as an intermediate-care facility for the mentally retarded. Neither Farnsley nor police would provide details about Beaudoin. Shuman will remain in the Butler County Jail until at least next Thursday, when he is due back in municipal court for a preliminary hearing. Shuman will be placed alone in a cell where corrections officers can observe him, Deputy Warden Mike Craft said. Wednesday evening, the Shumans went home to the task of breaking the news of their son's arrest to his grandparents, to friends and to members of Greenhills Community Church, Presbyterian. Many people at the church knew him as a usually sweet and innocent young man who had taught others how to be more accepting of people like him. "He's been a gift from God to many people," Bonnie Shuman said. "I don't know of anybody that could think he would do anything like this intentionally." People with Fetal Alcohol Spectrum Disorders need to be protected from their disabilities. Not all people so affected have mental retardation, in fact 85% have an IQ in the normal range. Not all people with Fetal Alcohol disorders are aggressive or violent, in fact most are sweet and affectionate and would not hurt anyone. But most affected individuals have the social-emotional development of a young child, with stunted conscience development; they lack impulse control, and have very poor judgment. They cannot always control their behavior. Each person has their own personal issues that they struggle with, and most of these individuals make the same mistakes over and over, in spite of the consequences. Some appear to be quite smart and capable, but in reality they function at a level far below their chronological age. And so they are always at risk, of hurting themselves or others. Most of the time they are vulnerable to becoming victims but in a few cases the victims also become the perpetrators, because they cannot control their behavior. There is a great need for accurate information and proper training about Fetal Alcohol disorders for professionals in the service provider fields, especially systems that serve those with mental disabilities. And we need to provide appropriate treatment to individuals early in their lives so that situations like this one can be avoided.